Aerobraking is a spaceflight technique wherein an orbiting spacecraft brushes against the top of a planetary atmosphere. The friction of the atmosphere against the surface of the spacecraft slows down and lowers the craft's orbital altitude. The solar panels are used to provide the maximum drag in a symmetrical position that allows some control as the spacecraft passes through the atmosphere. The Aerobraking Wizard: See real-time views of where Odyssey is in its aerobraking orbits around Mars, its orbital speed, and many more details. [no longer available]. 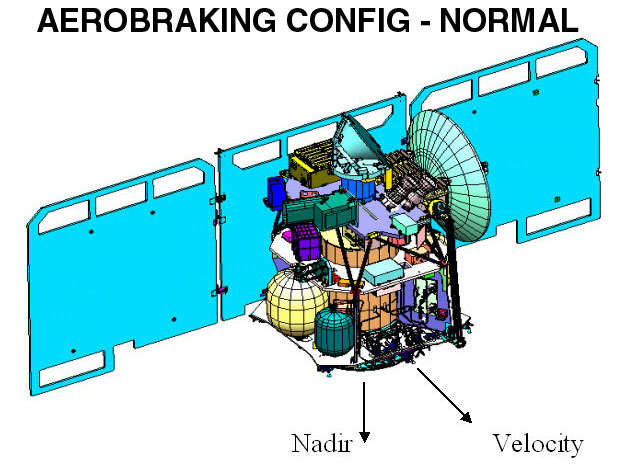 See the aerobraking video, which describes how navigation team members slow the spacecraft down and bring Odyssey into its circular, science mapping orbit. To find out what Odyssey will be studying at Mars, take a look at Odyssey's science goals, the technology that will make discoveries possible, or hear directly from some of Odyssey's lead scientists: Bill Boynton from the University of Arizona, Phil Christensen from Arizona State University, and Frank Cucinotta from Johnson Space Center.